Each year, we work with NYC NPF program leadership to identify their most important unmet needs. In 2016, we launched the Heart's Desire Fund (HDF) to help vulnerable mothers improve the lives of their babies by furthering their education or careers. Under HDF we review applications from interested mothers and make awards for such things as tuition grants, Metro Cards, laptops, books and certification fees. By removing the financial obstacles that face these moms, we hasten their exit out of poverty and reduce their stress during their child's most critical years. In 2018, Friends of NYC NFP made awards totaling $50,000 to 61 participating mothers who were then able to further their education or professional credentials. Click here to meet our awardees. While our Heart’s Desire Award program will remain a core element of our efforts to support NYC NFP mothers, NFP staff has also asked for our assistance with additional programming for the moms. We call our programs LEAP for Learn, Eat and Play and by the end of 2018, we will have provided more than 30 individual sessions using the help of 40 volunteers. Help from volunteers is essential to our success. 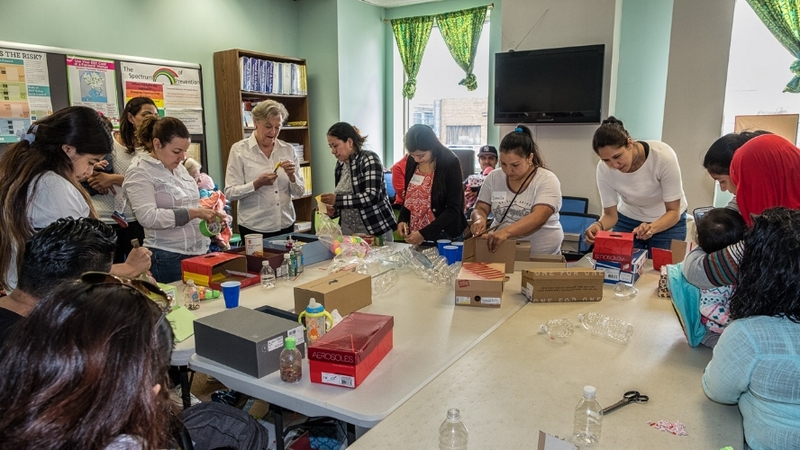 During he workshop pictured above volunteers helped mothers make educational toys for their babies out of common household objects. We also run sessions on topics related to nutrition, interacting with your child (playing or reading), money management and more. It is hard to know who has more fun, the volunteers or the babies. Mothers and fathers thoroughly enjoyed the day and received a take home booklet of instructions for additional toy making. Nurses report that moms ask for group gatherings that bring them together with other mothers for fun and learning. These events increase peer support as well as attachment to NFP by allowing mothers to feel that they are part of a larger program. Our events combine fun and learning. Topics nclude content areas such as: parent-child interaction, nutrition, money management and career development. We need volunteers to look after the babies, offer hospitality and help with logistics. We need other, skilled volunteers to help us develop and deliver the programs. We offered our first Learn, Eat and Play (LEAP) program last spring and many more in 2018. These sessions are educational and fun and they relieve pressure on our dedicated nurses. Please contact Susan at 203-518-2432 if you would like to learn more or are ready to get involved. We can always welcome new volunteers.